Cartilaginous fish (scientific name Chondrichthyes) have a skeleton made from cartilage instead of bone. Cartilage is tough and flexible and provides enough structural support to allow these fish to grow to very large sizes. 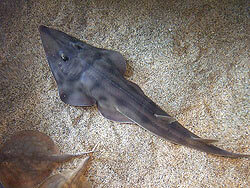 Cartilaginous fish include sharks, rays, skates and chimaeras. There are approximately 600 different species of rays and skates and about 500 shark species. Rays and skates live in oceans throughout the world. Most rays and skates live on the bottom of the ocean while some live in open water. Some rays also live in freshwater. The manta ray (Manta birostris) feeds on plankton and small fish is the largest ray reaching up to 9 metres in width and can weigh several tonnes. The common skate (Dipturus batis) is the largest skate in the world, reaching up to 2.5 metres in length with a life span of about 50 years. The smallest ray is a short-nose electric ray which is only 10 cm across and weighs about 0.5 kg. The smallest skate is the starry skate (Raja stellata) which only reaches a maximum total length of 76 cm. The mouth, nostrils and gill slits of skates and rays are always found on the underside of the fish, with the eyes and spiracles on the upper side. Many species also have spines and thorns on the upper surface and tail. 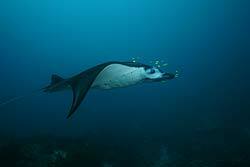 Like sharks, it is easy to distinguish mature males as they have a pair of claspers beneath the pelvic fins. These are absent in females. There are many different types of rays including stingrays, electric rays, butterfly rays, round rays, manta rays, guitarfish, and sawfish. Generally speaking, stingrays are kite-shaped and have streamlined tails with one or more venomous barbs. Skates tend to be roundish or triangular in shape, with heavier, fleshier tails that have small fins toward the end. 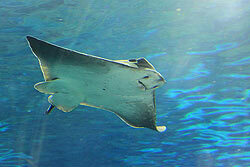 Rays whip-like tails have one or two stinging spines. 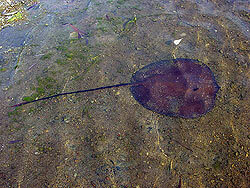 Rays defend themselves using the stinging barb on their tail as a weapon against predators. When the barb pierces a victim venom is released. The barb’s edges are serrated and once embedded it’s very difficult to remove without causing more damage. Skates do not have barbs, relying instead on thorn-like formations on their backs and tails to deter predators. Skates have fleshier tails which lack spines. Dermal denticles The tough skin of skates and rays is covered with dermal teeth (dermal denticles) making it feel like sandpaper. In most species, all dermal denticles are pointed in one direction, making the skin feel very smooth if rubbed in one direction and very rough if rubbed in the other. Denticles provide protection and, in most cases, streamlining.. The major difference between rays and skates is how they reproduce. 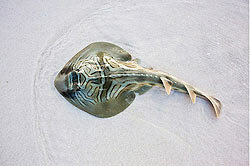 Fertilization is internal for both rays and skates. 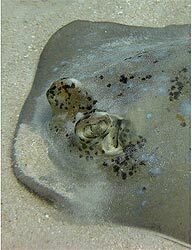 Rays are live bearing (viviparous) while skates are egg laying (oviparous), releasing their eggs in hard rectangular cases sometimes called "mermaid´s purses". The dark-brown to black cases sometimes wash up on beaches. There is no parental care after birth; however, some Chondrichthyes do guard their eggs. Also, skates typically have a prominent dorsal fin while the dorsal fin is absent or greatly reduced in rays. Cartilaginous fish all breathe through 5 to 7 gills, depending on the species. In general, open water (pelagic} species must keep swimming to keep oxygenated water moving through their gills whilst bottom-dwelling (demersal) species can actively pump water in through their spiracles and out through their gills. Chimaeras are also known as ghost sharks, ratfish, spookfish and rabbitfishes.Their closest living relatives are sharks, though in evolutionary terms they branched off from sharks nearly 400 million years ago and have remained isolated ever since, usually found in deep water. Chimaeras live in temperate ocean floors down to 2,600 metres depth, with few occurring at depths shallower than 200 metres. They have long, soft bodies, with a large head and snout, which is modified into an elongated sensory organ, and a single gill-opening. They reach up to 150 centimetres in length including the tail. 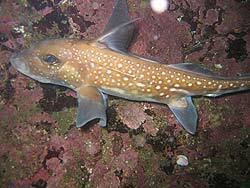 They have smooth skin without scales and most have a venomous spine located in front of the dorsal fin.